Salmonellosis - body, causes, What Is Salmonellosis? Salmoneliosis (sal-mo-nel-O-sis) is a gastrointestinal disease caused by bacteria called Salmonella. This type of bacterium usually is found in foods such as poultry, milk, and eggs from infected animals. Salmonellosis is an illness caused by Salmonella bacteria that affects the intestine, usually resulting in diarrhea. In some people, the infection spreads to the bloodstream and other areas of the body and can be life-threatening unless they receive prompt treatment. Salmonellosis, named after the American scientist Daniel Salmon, is one of the most common causes of food poisoning in the United States. Each year, about 40,000 cases of salmonellosis are reported to the U.S. Centers for Disease Control and Prevention, and up to 4 million additional cases may go unreported. About 1,000 people die each year of complications related to salmonellosis. Infants, the elderly, and people whose immune systems * are weakened are most vulnerable to severe infection. How Do People Get Salmonellosis? In the United States, people usually get salmonellosis from eating or drinking contaminated food, most often raw milk or undercooked poultry and poultry products such as eggs. Undercooked ground beef or other meat can also cause salmonellosis. In some cases, food can be contaminated by the people handling it. Salmonellosis can also be spread through the stools of some pets, especially reptiles and pets with diarrhea. The structure of a Salmonella bacterium. The DNA (inside the nucleus) is yellow. The cytoplasm is green. 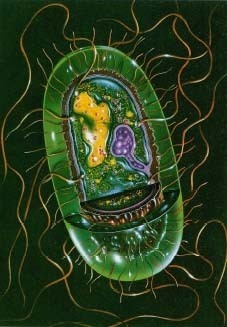 The part of the cell wall shown in brown secretes the tox-ins that cause symptoms in salmonellosis. © 1992 Custom Medical Stock Photo. A different species of Salmonella bacteria causes typhoid fever, a serious disease common in developing countries in Latin America, Africa, and Asia. Typhoid fever is spread by food and water contaminated with the bacteria. Clean water, treated (pasteurized) milk, and effective sewage systems have made typhoid fever rare in the United States and other developed countries. * immune system is the system that defends the body against disease. The symptoms of salmonellosis include diarrhea, stomach cramps, pain, fever, headache, nausea, and vomiting. They occur within 12 to 48 hours of eating or drinking contaminated food. How Is Salmonellosis Diagnosed and Treated? Salmonellosis is diagnosed through stool cultures from people with symptoms of the infection. Salmonella infections usually run their course without treatment in a few days to a week after an unpleasant period of vomiting and diarrhea. Health care professionals suggest that people drink lots of fluids and eat a bland diet while they recover from salmonellosis. Sometimes the symptoms create other problems, such as dehydration * . In those cases, people may need to go to the hospital to receive replacement fluids through their veins (an "IV"). Antibiotics may be used if the infection spreads beyond the intestine, but salmonellosis is often resistant to drugs. Thorough cooking (until poultry or meat, especially ground beef, is no longer pink and eggs are no longer runny) and regular hand washing (after using the bathroom, and between handling raw meat and other foods) are the main ways to prevent salmonellosis. Only pasteurized dairy products that have been kept refrigerated should be used. Raw meat or eggs should especially be avoided. * dehydration is the loss of fluid from the body faster than it can be replaced. U.S. Centers for Disease Control and Prevention, 1600 Clifton Road N.E., Atlanta, GA 30333. This U.S. agency helps control communicable, carrier-borne, and occupational diseases and prevent disease, injury, and disability. A fact sheet on salmonellosis is available on its website. U.S. National Institute of Allergy and Infectious Diseases, Office of Communications and Public Liaison, National Institutes of Health, Building 31, Room 7A-50, 31 Center Drive, MSC 2520, Bethesda, MD 20892-2520. This government biomedical research center posts a fact sheet on salmonellosis and other foodborne diseases on its website.